Warning: This parody is a shameless exploitation of Bogart’s “Treasure of Sierra Madre” and Hemingway’s “Old Man & The Sea.” It pokes fun at the rising elite of consulting, i.e. those involved with performance analytics or “the revolution in analytics.” Yet it raises serious issues around the capabilities and limitations of certain kinds of analytical modeling. Revolution! The Old Man, a bearded Operations Research analyst in the back of the bar stirred from his siesta. He moved slowly, almost painfully as ancient bones strained to come alive. But his eyes were coal-black, glinting with some sort of passion or maybe just crazy from the heat. He tipped his sombrero and squinted..the eyes said it all: “I’ve been in the mountains with Fidel!” A relic of the past hung from the Old Man’s belt, a HP RPN calculator. They said he belonged to the old Operations Research Society of America (ORSA). They said when he has too much tequila he did matrix math with a pencil and paper. He scares the undergraduates. Maybe he had been in the Sierra del Escambray’s with Fidel doing some sort of weird linear programming or optimization? Rumors? No one really knows. It’s About Insight “Revolution in Analytics? Revolution in Analytics?! We don’t need no stinking Revolution in Analytics.” he mocked. 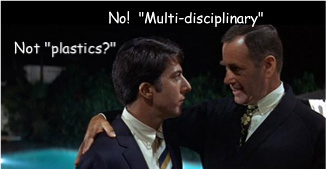 “Hey Amigo, we’ve been doing quant math and running yield management optimization programs since before you were born.” The Old Man was getting more and more agitated now… “You go back and tell Sam Palmisano what he can do with his ‘revolution’ and where he can stick his predictive analysis. It ain’t about crunching numbers! It’s about insight! Ain’t nobody s-plained to you about complex adaptive systems or CAS? Eh? No? Well you can kiss your assumption about equilibrium and stationarity goodbye! No more stochastic processes. No more deterministic solutions!” Getting in The Blogger’s face now: “Do you know anything about indeterminacy and heuristics? Emergent properties? Yeah! I didn’t think so. 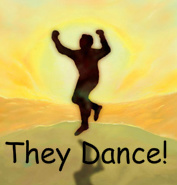 And neither does Palmisano!” The Old Man was on a roll now and there was no stopping him. He was animated, a cross between Zorba the Greek and Hunter S. Thompson. It was frightening but fascinating at the same time…we were spellbound. But now the Old Man was spent. He was tired and needed rest. So he went down to the sea to watch the waves dance and was lost in the hubris of the past. There’s a lot of hype going around about analytics. And that’s to be expected in fields that re-emerge every twenty or so years into managerial mainstream. We had Operations Research during World War Two, the RAND years of quantitative systems analysis during the Kennedy and Johnson Administrations, Chaos Theory and the hedge funds during the 1990’s, and so on. When good data and good theory converge the results can be astounding, as in the airlines yield management and optimization innovations. We also can look at predictive analytics in maintenance and equipment failures, and I recently wrote a piece reviewing a JAMA study on how performance analytics were reducing the risk of heart attacks mortality during hospital stays. Even though this is a “healthcare” orientation, the methodology and epistemology is brilliant and can serve as a template for virtually any industry. 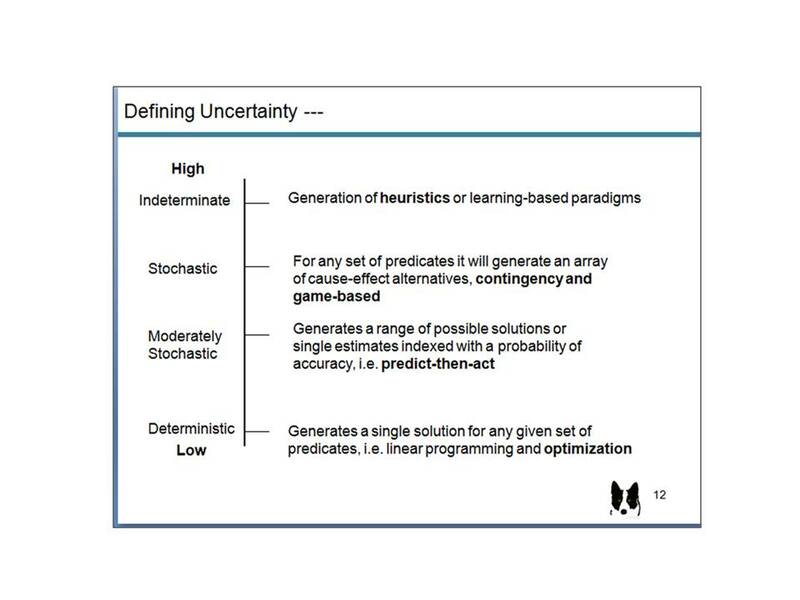 And although I poke fun at combining quantitative analysis with the high levels of uncertainty accompanying CAS, I am optimistic we can accommodate both views simultaneously (see my CERTS posting). However, when bad theory dominates, as in the RAND/ McNamara employment of Planning, Programming & Budgeting during the Vietnam War….well, in that case a lot of good people died. We can never let that sort of analytical hubris happen again…. 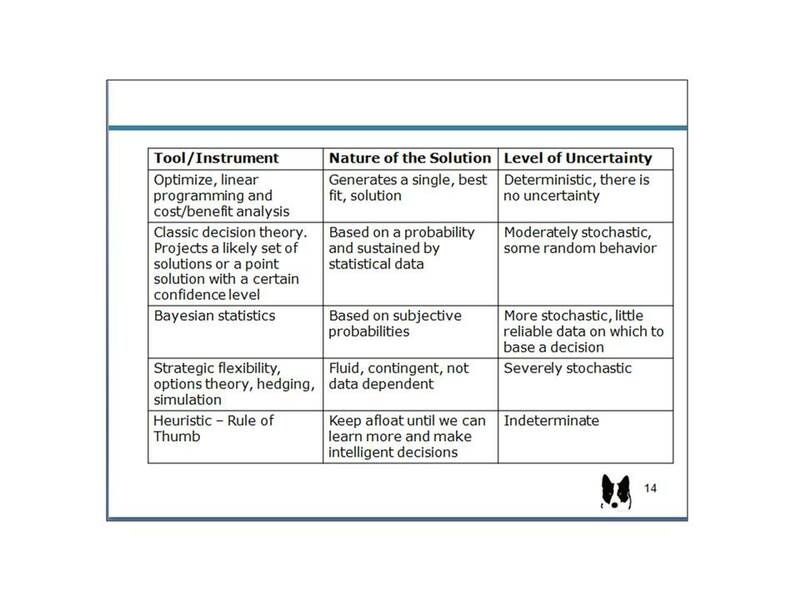 see Marke “Approaches to Risk Under Conditions of Uncertainty and Complexity” presented at the Society for Risk Analysis 2007 for a critique of McNamara’s approach. I think there is a middle ground. It focuses on a multi-disciplinary approach that is not dominated by the tool kit. Yeah, yeah, I know….you already spent a lot of money positioning this “new” service as “analytical.” Repositioning is gonna drive the marketing-types nuts. Here are slides from the SRA presentation (referenced and linked above) that may prove helpful (click to enlarge). They were adapted from John Sutherland’s A General Systems Philosophy for the Social and Behavioral Sciences; 1973. I am happy to discuss at length should there be interest in the field. And keep smiling!